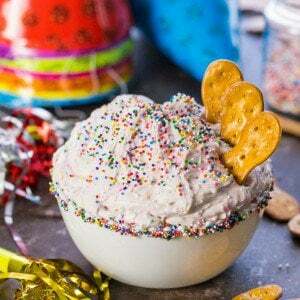 Skinny(er) Funfetti Cake Batter Dip is the perfect EASY sweet treat to bring to your next birthday party. Yum! This is the perfect sweet dip to make for kid's birthday parties, or a quick dessert after a long day. In a mixing bowl, whisk together cool whip and greek yogurt until smooth. Add in the cake mix a little at a time until well mixed. Refrigerate before serving, overnight if desired.